“I recently purchased your Cycle 3 Morning Time Plan. I have been a CC mom for over 7 years, 4 kids, oldest is in Foundations and Essentials. While reading through the plan, I found your NAMES Tool and explanation. I was at Practicum this year (I’m also a Support Representative, but because of that, I tend to be floating around during the sessions ;). I completely missed this theory behind the memory work. Now going through cycle 3 for our third time… I have felt a bit like memory work has become drudgery. I don’t nearly enjoy as much as I used to and I think my kids sense that as well. After reading your words of wisdom and explanation for the acronym…. You have renewed my soul and spirit towards memory work. I feel like I have a new starting point and better understanding. 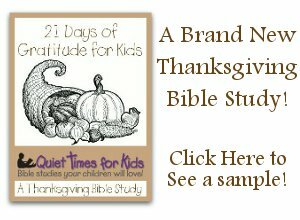 As a Mom, I love the Quiet Times for Kids series because it’s an opportunity for even my small children to search the Bible and get involved with their own personal Bible study. I also love how it allows them to work independently as I help the very youngest children in our family. My kids can’t wait for the next Bible study! I have done the Proverbs Study, the Church History Study, the Sermon Notes, 30 Days With Jesus and I am now working on Animals in the Bible right now. I like doing these because I feel that it draws me closer to God and Jesus and I think it is fun too! I enjoy the church history study the most probably. I also like to draw and it gives me a chance to practice that, and helps me with my handwriting also! My favorite part about Quiet Times for Kids is looking up verses and drawing pictures of animals. It helps me learn the bible better. I think these studies are good because it shows kids what the bible says about many things. It really helps me learn about church history to do the Trial and Triumph pages. I really liked it – it was easy and fun. I liked that it was spaced out and not crammed together. It seems like a good one for little kids and an easy one for older kids. If you would like to send a picture of your child working on their Bible Study Binder along with a testimonial, we would love to put it on our site!